The Embassy Apartment Hotel dates back to the time when Santa Monica was the last railway stop on the Los Angeles train, when families came to Santa Monica to holiday and enjoy the sunshine and beach activities, as well as hunting and hiking in the nearby Santa Monica Mountains. 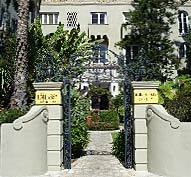 Constructed in 1924, the property includes a three and four story Spanish Colonial Revival-style apartment hotel and is an outstanding example of Moorish influenced Mediterranean design. City records note that the Embassy Apartment Hotel incorporates many of the features typical of the Spanish Colonial Revival style. Stucco sheathes the exterior, while red clay tiles cover the gables of the roof. Spiraled, engaged columns with slender proportions mark the corners of the structure. The building is asymmetrically organized incorporating paired casement windows, corbelled and wrought iron balconies, and loggias. While most windows are flat-headed, several are arched; some are glazed with bottle glass. 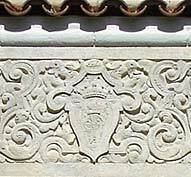 Both wrought iron and pierced stucco window grilles are employed extensively along the primary elevations. The distinctive decorative treatment includes a frieze composed of a band of shields at the roof line, a raised entrance from the courtyard with a Churrigueresque inspired surround, spiraled columns in one loggia, and vermiculated, engaged columns between some windows. 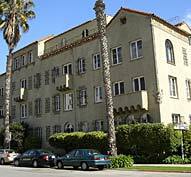 The Embassy Apartments was designed by architect Arthur E. Harvey who also designed several notable buildings in Los Angeles, including the American Storage Company building (1928-1929), the Selig Retail Store building (1931), and the Chateau Elysee Apartments in Hollywood (1928). The lot size is approximately 125 feet by 150 feet. The large L-shaped apartment complex fronts west and is located in a primarily multi-family residential neighborhood. The area was developed with only scattered structures until the turn of the 20th century, but most lots were developed by the 1930’s. The Embassy was constructed at the peak of this development and was designed to attract high-end tourists looking for elegant accommodations for long-term stays as an alternative to the resort hotel or beach club. It reflects an era during which Santa Monica business people took part in a regional effort to boost year-round tourism by promoting the benefits of the beach location in both summer and winter. Noted muralist Hugh Ballin was one of the high-end tourists that lived at the Embassy during its heyday. The Embassy is additionally unique in that it has continued to function as both a hotel and an apartment building, while other similar buildings have become apartment buildings. The Landmarks committee would like to one day incorporate the Embassy Apartments as part of the “Elegant Apartment Buildings Thematic District,” a potential historic district consisting of four apartment buildings located in near proximity to each other on 3rd and 4th Streets and California and Washington Avenues.